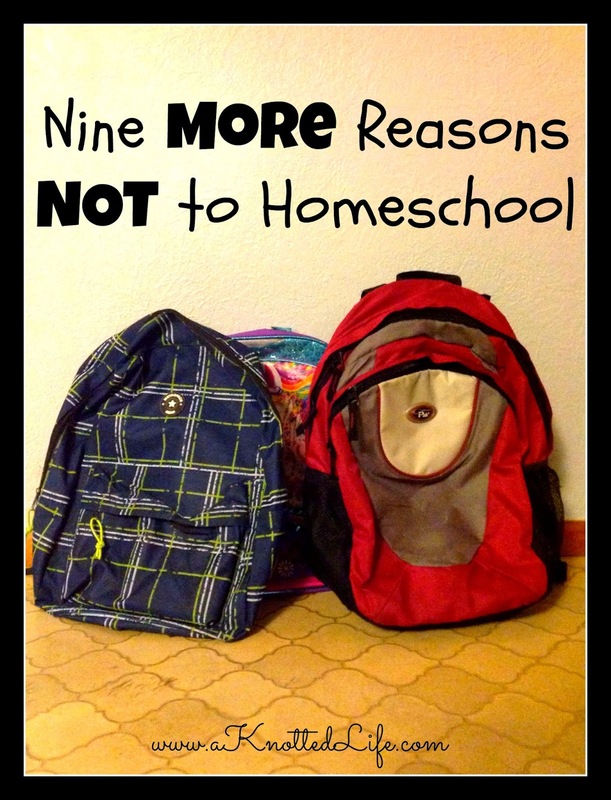 Maybe you saw the post that listed off 9 Reasons You Should NOT Homeschool. It kept popping up in different feeds I follow and so I eventually read it, even though I already know all the reasons we're not homeschooling. Now, I am 100% sure the author is a lovely, warm, kind woman. But most of her nine reasons really rubbed me the wrong way. I think that Jen and I would agree on the bottom line on most of her reasons. However, as someone who has very happily chosen traditional school for my kids, I wanted to rephrase her wording to better represent the reasons why my husband and I made the decision we did to not homeschool. 1. She said: You are bound and determined to recreate school at home. I say: You know you cannot recreate school at home. Your twelve years in a traditional classroom were wonderful, filled with dynamic teachers, a wide variety of friends and acquaintances, and many opportunities. You know that some of those can be recreated in a homeschooling environment but some of them are very specific and unique to a traditional school setting. You want to offer that same, unique experience to your kids. 2. She said: You aren't willing to step out of your comfort zone. I say: You know your strengths and your weaknesses; you understand your temperament and you know that, while you like a challenge, homeschooling is not what's best for you, your kids, or your family. 3. She said: You don’t like to learn new things. I say: You are interested in educating and building up your children, family, and community through traditional school. 4. She said: You don’t want to be an active participant in your children’s education. I say: As a parent you are obviously the first and primary teacher of your children, especially in the most important things. You want to be an active participant in your children's education but you also don't want to be the only one. You respect teachers, their educations, and the incredibly special skill set, passion, and talent that they possess. You believe that your children benefit from being with such professionals. 5. She said: You don’t like to be in charge. I say: You know that, in the end, you are always in charge of your children. Others may guide, educate, and discipline your children, and you are happy to work with them to give your child the best. You also understand that if traditional school is not working for your child then, because you are in charge, you will change the situation for the benefit of your child. 6. You are homeschooling to please someone else. I say: Totally agree with her there! 7. She said: You lack perseverance. I say: You're in a rough season of life. If you already feel overwhelmed, maxed out, or stretched too thin then this is probably not the best time to add educating all of your children at home to your list of things to do. Sometimes all you can do is survive, not plan chemistry labs and correct handwriting. 8. Homeschooling is an experiment. Once again, I agree. I have a lot of respect for homeschoolers and I know it takes a lot of work. Giving it a go for kicks and giggles, or because you know other homeschoolers, or because it's the trendy thing to do is not a good idea. Homeschooling should come with a conviction and a desire. 9. You don’t like things to get messy. I say: Life can be messy, especially with kids. Going back to #2, if you know that you need more order and less clutter and chaos then traditional school is likely a better fit. She said: Homeschooling is about so much more than math lessons. Homeschooling is when learning and life collide, and that’s a good thing. I say: Education is about so much more than math lessons. Education is when learning and life collide, and that's a good thing. If you choose to homeschool that is great. Homeschooling is a fantastic option. Good for you for knowing what's best and for making that leap. I support you and I believe in you! You can do this and you will be awesome! If you choose to not homeschool it's not because you are too lazy, stupid, or stubborn. It's not because you lack the right virtues. It's not because you're not a good enough mom or that you don't enjoy your kids enough. You have enough; you do enough; you are enough. If you choose not to homeschool it's because it's the best decision for your family and don't let anyone else make you think otherwise. I really appreciate this post Bonnie!! We are considering homeschooling Grace in pre-school while she is in therapy 5x a week; I always went to traditional school, and am slightly scared, but excited at the prospect! My husband was homeschooled 2-8 grade, and my parents were definitely the kind that homeschooling would not have come naturally. We all must embrace our talents! We've definitely considered home school for similar reasons, though the majority of Emily's therapy next year would likely be through a special ed preschool program, so that might be a moot point. It, like most of parenting, sounds incredibly daunting when you're thinking about doing it. I think the fact that much of it is possible when it actually comes to pass is a true testimony to His amazing power in our lives. He works miracles through us. James attends public school for his speech therapy. He was in Early Intervention until he was 3 and then at that point he had to attend the Early Childhood Education to continue with free services because that's how it works in the state of Illinois. At first it was really hard to send my 3 year old away to pre-k. Lydia did not do any pre-k, Bennet is in a pre-k4 program but he just turned 5 and I knew he was old enough, ready for it, and would really benefit. But James - my little James - that was tough! However, it's been the BEST thing for his language development. Having his IEP being incorporated in the classroom and having the speech therapist working with him several times throughout the week has been really great for him. This makes me so happy to hear Bonnie! I love "homeschool" preschool for our family, but there are some really awesome Early Childhood Special Ed classrooms out there! I'm so glad James is in a good one! My kids go to public school for now although I am interested in homeschooling them one day. I, for one, am sick to death of the implication that parents with kids in public schools are lazy or stupid or just don't care about their kids. Sometimes it is the very best you can do for any number of reasons. All of this makes my head spin. I would love to try homeschooling. And Catholic school isn't an option. Public schools here can be amazing. Others are a bit scary. I have heard it said that you take it a year at a time. That sounds nice to me. One year at a time, one child at a time! That's the way to go. That's my opinion, having been homeschooled, myself, K through 12. This post was incredibly timely for me (hello, Holy Spirit!). I wanted to homeschool my almost 4-year-old, but he is eligible for a preschool program that would provide more knowledgeable support for the developmental issues we are having evaluated. It's harder than I thought it would be to let go of what I wanted, but my husband and I both agree that it's better for our son to work with trained professionals at this point. Sometimes homeschooling just doesn't work, and it's important for the family's sake to know when to say when. PS: I didn't read the original post, but the tone of the lines you quoted rub me the wrong way, too! Thank you Bonnie - I *think* I see where the original author is coming from, but I think some of her phrasing was poor. I agree with a few of the other commenters; I get tired of hearing homeschooling encouragement that, hopefully inadvertently, tears down public/private schoolers by suggesting that homeschooling is the only way to be involved in your children's education, etc. I could see where she was coming from too but I didn't find her post helpful at all. What woman would read, "You don't want to be in control of your child's education, you don't want to learn new things, you lack perseverance" and say, "Oh! That's me! So glad I read this list! I'm not going to homeschool and I feel great about myself as a mother!"??? To me, the post implied that homeschooling was just for moms who are cut out for it and if you're not... well... there's always the less desirable brick and mortar schools. It seemed to be written more for moms who already are homeschooling, not moms who are trying to decide. That's definitely true, Molly! Travis jokes with me all the time about how I would never be a good teacher. I may know my stuff, I may be great with kids, but I should never be in charge of a classroom. And he's right! Juuuuuust to play devil's advocate here, Bonnie, but when you say, "You know you cannot recreate school at home. Your twelve years in a traditional classroom were wonderful, filled with dynamic teachers, a wide variety of friends and acquaintances, and many opportunities. You want to offer that same experience to your kids", it makes it seem like you think that homeschool doesn't offer those things. It would be the rare homeschooling parent who wants to be their children's only teachers, and have the home the only educational setting. Most homeschoolers offer their students "dynamic teachers" in the forms of co-ops, field trips, extracurricular activities, scouts, youth groups, etc. etc. Homeschoolers are not kept locked up in home, able to socialize only with siblings. They, too, are able to have a "wide variety of friends and acquaintances, and many opportunities." It's not an either/or situation, and while I don't think you purposefully mean to set it up as such, your first point sounds like it. Educational decisions are so overwhelmingly person and emotional, I know it's hard to talk about it at all without someone feeling judged or defensive. Thanks for throwing your hat into the ring, and offering your point of view. For what it's worth, that original post rubbed me the wrong way, too, and I *do* homeschool! I definitely know that - and I'm glad you point it out - but I also know that traditional school offers other experiences that I've never seen recreated in homeschool: Homecoming Week, school spirit, cheering for the home team as they make their way through sectionals and on to state, therapies, and even the structure of the day. I know some families choose to homeschool their kids because they don't like the structure that traditional school dictates (they'd like to be together as a family much more) but I really enjoyed as a middle schooler and high schooler being a part of activities that I was responsible for, staying after school, building them into my schedule, and doing those things without my mom driving me across town to be in play practice here, choir practice there, an environmental group over here. For me, they were all housed in the same place and I was in charge of managing it. That's not to say homeschooled kids aren't in charge of managing theirs too, but - at least from how I've seen it work and seen homeschooling moms talk about it on FB - I was much more autonomous (in a safe and good way). I think there might be more ways to integrate more traditional experiences if that's important - tumbling teams, community theater, a local Christian school that allows homeschoolers to opt in to band, choir and a variety of athletics. I don't think it has to be so all or nothing in either direction. We've homeschooled and done private school. The conversation has started back up about sending our oldest to school because she's wanting to go back, but we're weighing our options. It's wonderful to have good choices to choose from. That first post was super judgey, which does nothing to build up the compassion we should all have for each other. My friends that send their kids to public and private school thought about those decisions. It wasn't to be lazy or because they didn't want what was best. It was *because* they knew those options worked for their family. Our new foster is going to a special needs public preschool and I'm grateful my tax dollars are getting her some much needed services. I think you're right that my daughter is less autonomous as a homeschooler than I was a public school kid, but she's 9, she doesn't need to run her own life quite yet. I'm having a hard enough time accepting that she liked none of my ideas for Halloween costumes and is instead going as Pikachu. I hope we can all just learn to be more thoughtful in how we present our choices and give each other the benefit of the doubt......and when we crazy homeschoolers try to foist our ideas on others, it comes from love (I hope) of our lives and a general joy at the hands-on all-day stuff (when we're not pulling our hair out and hiding in closets, that is). In real life this kind of stuff never happens, at least not to me. Many of my closest friends and favorite people are homeschoolers and we have nothing but respect and appreciation for how we're raising one another's kids. I wonder if the internet is more likely to feel judgey because that's where we come to vent. Or maybe it's just because if a bunch of homeschooling moms are talking smack about traditional school moms we don't know because we're not at the co-op, whereas the internet is open for anyone. Maybe I'm naive, but I get the feeling that that's just not happening. I love your take on this. The only thing I disagree with is the one you agreed with her on - "Homeschooling is an experiment." Of course it is. Everything is. All we can do is try and see how it works. We can't know how or if it will work until we try. And it's easy to let our commitment keep us pinned in a school choice that isn't working. Thanks for sharing your take. Love it. I'm planning on homeschooling but my husband and I also understand that it may not be forever. We might decide traditional school is what works. One of my kiddos is on the spectrum and we are fortunate that many charter schools support homeschooling families and therapies for special needs are included. I've HSed for 10 years and still Hs my youngest. Though he will go to high school in 3 years. My oldest is now in pub high school for a variety of reasons....wow, a LOT of reasons.FWIW, my hubby is also a teacher...highs chool sci and I taught for 14 years before becoming a mom. Can I tell you how defensive my family ( a family of teachers ) became when back when my oldest was old enough to go to kdgn we said, Oh yeah, he;s not going to schooll, we;re doing school at home. The torrent of negativity was overwhelming. Well it wound up being the BEST choice for years for us. Years. Now, no longer, Can I again say how the mommy wars rear their ugly head ....it's no longer SAHm vs "working" moms, but HS vs traditional school families and it's ridiculous. I am SO made to feel like I am "throwing the towel in" when I reg my son for school. I literally read a blog psot a few yrs ago that said "There;s a special place in heaven for moms who Hs all the way thru to college." WOW. Talk about adding eve more doubt and guilt as we had just made our decision to send him to school. It IS such a personal decision and while I know we made the right one for HIM and for US, it is absolutely way way less than a stellar situation....BUT it does work and there ARE many bright spots in his days due to excellent courses, really really good teachers and challenges he is receiving.....MUCH more so than I knew I could give him a t home. Yes!! ALl those things Bonnie, that you mention about sports, spirit week, and the spec ed stuff like therapy and etc...YES. All play a role in the decision. Plus add to that the fact that I was just plain on burn out. I do give credit to the moms who HS, but I also know that being an active parent to a child who's in school is VERY hard yet very important. How on earth can I send him away to college in 4years w/o this "dry run" of sorts called high school? How will he manage? How will he navigate the waters of issues such as kids offering him a baggie of pot ( yes it happened on his 3rd day of school and again a week later)and even the more basic stuff such as the logistics of schedules, bringing the right books and assignments to the right classes at the right times? Silly things like this have impeded his progress and his report card already....you know forgetting work, leaving Hs in his locker, forgetting he had a test on a certain day He's in all honors, but it's not just about the academics....there's so much more. Maybe for some families, the whole HS thing CAN work thru college. But it won't for us and my prayers were answered when I asked God for help in discerning the right way to school my son. It was clear when I realized one AM : I suddenly knew when to say when. I was comfortable with the choice to send him. WISH we could chat in person about all this and more...but this is the next best thing. Oh my word. Bonnie, you are a nicer person that I am. I read that article and it made me so annoyed. It oozed with a self-righteousness about why some people don't homeschool. It's judgmental and does nothing to build up the body of Christ. I've done both routes and I don't think I lack perseverance or a desire to learn new things or am uninterested in my kids education. When I left homeschooling, I think I helped some of my homeschooling friends become less judgmental, when they understood our situation. I guess I understand that homeschooling is so tough that you really need that confidence to in the fact that this is the best way for your family, but sometimes there are women out there, like that blogger, who take that too far. I've literally started telling people we're practicing feral unschooling. Because Scandinavian kids stay out in the woods until they're 8 and practice oneness with nature. Or something. My head is just spinning with all the different options out there, and I feel so ill equipped to make any choice. So thanks for writing this. Personally, I LOVE LOVE LOVE hearing from families who have good experiences in traditional school. It gives me hope that if/when the day comes that we change our mind (again) about school and send one or more of our kids to a regular school, that all will be fine. Thanks for your post, Bonnie! This was important. thank you for writing it. I would agree that the article was stated poorly. I think we homeschoolers sometimes are hit with so many people looking at us like we are freaks and saying things like, "I could never do THAT... " followed by some horrible reason like, "I can't stand being around my kids that many hours a day!" or "I can barely add!" that it is easy to get on the defensive. We aren't superheroes or ultra-patient or gluttons for punishment, we are regular moms. We have days where the kids drive us crazy and where the aggravation has us googling the phone number for the nearest traditional school for a visit. I think the author of the post was trying (albeit poorly because she may have been overly defensive) to say that the only reasons you really shouldn't homeschool are these... if you don't have any desire to learn, for example. Nearly no one would claim that, of course. But if you did, you really shouldn't homeschool. That being said, I think she overshot the mark because if you do love to learn, it doesn't mean you MUST homeschool. It just means you are normal and you can do it! But you can also do a myriad of other schooling options too. I think what was meant to be humorous and encouraging came off as off-putting and unpleasant. I just offer this comment to try to consider the point of view she might be coming from. Thank You for those words! I struggle with that. Great post. I think that an open mind of Never say Never is important for those choosing to homeschool and those choosing the traditional school route. I used to say I'd never homeschool, but my second daughter was not ready, by any means, to start kindergarten at a public school. Because she's ours, because we know her best and know what's best for her, my husband and I decided to keep her home for kindergarten and i homeschooled her. I certainly learned that it was harder than I thought (even after being a public school teacher for 7 years), but that I was fully capable of doing it. Now, she's in first grade and wanted to go to the public school. We discussed it and decided to let her try. She's flourishing! She loves it! You just never know where life will lead you, where the Lord will nudge you to be. So, I think it's important to know that you may find yourself on the other side of the coin--a homeschooling parent sending their kid to public school or a public school family keeping one or more of your kids home to be schooled. Take each year with each kid as they come. Who knows what decisions you might make that you never anticipated making. Bonnie - thank you for taking the time to write this! The tone of the original post rubbed me the wrong way as well. We've been on both sides of the coin (this being our first year homeschooling) and appreciate even more how the decision for schooling our children is so particular and unique to each family...to each child even. And what's right for us this year may not be the next. I think it's impossible to say that one method is the right one for every family, for all their years of education. Thank God, He has created us so differently and calls all of us to so many different places! I think you're being overly sensitive. I'm not sure her reasons were especially apt or well-phrased, but who cares? Why write your own 9 things, that sound at some points equally condescending - and then defend them by pointing out more things that homeschoolers 'miss out' on? You prefer your schooling method, it's working for your family, great. She prefers hers, it's working for her, great. I'm not sure how this post adds to an educational culture that values family life and individual children's needs over our own adult needs to be validated with our every parenting choice. Martha! Thank you for the comment - I'm a fan of your blog and I'm glad you came to mine. I'm sorry you read my post as condescending. I definitely spent a lot of time trying to *not* be condescending so it's too bad I missed the mark with you. The original post was being shared and popping up in several places. As I read it and then re-read it I felt that for a mom who was trying to make the very personal and emotional decision of how to educate her child, a post called "Nine Reasons NOT to Homeschool" might be something she'd click on. If she did I didn't think that post would be helpful at all. There are lots of great reasons to choose homeschool and there's lots of great reasons to not choose it. I wanted to switch the conversation away from all the negative ("You don't want to have an active role in homeschooling" = traditional school) and use positive language. I did not write the post as an insulted mom trying to validate my parenting choice. I was trying to help phrase the conversation in a way that might make moms feel like they were making the best decision for their kid no matter what choice they made. Something some parents could read and say, "Yes. I do want to do that." and others could read and say, "No, that's not really that important to me." I hoped it would be helpful. I'm really genuinely sorry you read it as making matters worse. Finally, having spoken with several of my very good, homeschooling friends about this post both before and after it was published, I want to clarify that I was not defending my points by pointing out to Cari more things homeschoolers miss out on, but just to clarify my point. She was right: I made it seem too either/or and so I tried to address that - there's pros and cons to both sides but some things are very unique to traditional school (just like some things are very unique to homeschool). I am glad for your feedback and after thinking about what you and Cari said I did edit the first point, hoping it adds more balance.